The constellation of stars called Orion is one of the most recognizable patterns of stars in the northern sky (i.e. look up, for example). According to Ancient Myths, Orion is named after the hunter who was in love with Merope, one of the Seven Sisters of the Pleiades. Merope, unfortunately, would have nothing to do with him, and thereafter Orion added misery to heartbreak by stepping on Scorpius, the scorpion. [The rule is: never cross a Scorpio!]. After being stung twice (the first by Merope), the gods took pity and placed him in the sky as a constellation, where he was accompanied by his faithful dogs, Canis Major and Minor. The gods even included as nearby constellations the river Eridanus, and animals for Orion to hunt: Lepus, the rabbit, and Taurus, the bull. They thoughtfully placed Scorpius on the opposite side of the sky so that Orion would not have to be stung a third time. <http://www.astro.wisc.edu/~dolan/constellations/constellations/Orion.html> has the traditional, uncontroversial information about the constellation. I say, "uncontroversial" because the website still refers to Orion’s “sword” hanging from his “belt”. In their words, “From the northern hemisphere, the three bright stars (Alnitak, Alnilam and Mintaka) in a [near] straight line that form Orion’s Belt are easily visible on the southern horizon in winter evenings. 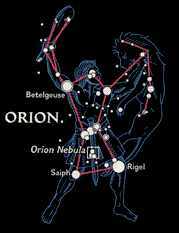 The bright star that forms Orion’s left shoulder is Betelgeuse. The name of this star means “The Armpit of the Central One” in Arabic, which shows that like many other constellations, Orion was recognized across many cultures. Other views include the fact that inasmuch as the Orion Nebula is a star-making factory of the first order <http://www.astro.wisc.edu/~dolan/constellations/messier/m42.html>, then perhaps a more appropriate description of that which is hanging down below Orion’s waist is that of a phallus. And whereas a phallus is properly located in the constellation, a sword in that position would more likely eliminate any phallus which might once have been there. [Which might have been just as well considering Orion's singular lack of luck with respect to the ladies.] No male wears a sword between his legs, and very few hunters carry a sword! <http://www.nationalgeographic.com/stars/attractions/index.html> provides an excellent picture of this feature. 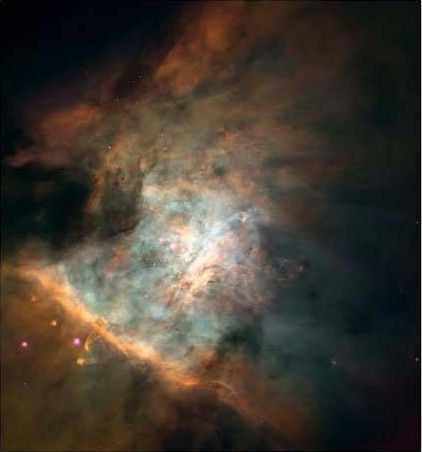 Note also the link to the Orion Nebula -- where National Geographic does its typical, outstanding presentation. The photograph below, for example, is taken from this site and reprinted here with permission. Keep in mind that astronomers are still calling “MyCn18” the “Hourglass Nebula”, instead of describing it more accurately as a Vesica Pisces. What a bunch of nerds! But then astronomers don’t really understand Astrology either. Their loss. There is also precious little mention of Sirius, the brightest star in the sky. Siriusly! They don’t even mention the fact that two stars of Orion’s effectively point to Sirius, and that the connection between two of the greatest wonders in the night sky are basic to countless ancient civilizations. In Egypt, for example, The Great Pyramids of Giza (as well as those of Teotihuacan in Central Mexico) have the same relative placement as do the three stars of Orion’s belt, Mintaka (d), Alnilam (e), and Alnitak (z). Orion is also Osiris in ancient Egyptian traditions, and Sirius (a binary star with possibly a third companion) is often linked with Isis (Osiris’ wife) as Sirius A, Osiris as Sirius B, and Sirius C (if it exists) with the Dark Goddess. Orion and Sirius are so fundamental to ancient Egyptian thought that it appears to have spilled over into modern times. The original insignia for Apollo 13, for example, showed the constellation Orion in the background. The insignia was later changed, but survived in the movie, Apollo 13 (the one directed by Ron Howard)! Richard Hoagland of the Enterprise Mission even claims that most of NASA’s planned events coordinate in various fashions with Orion, Sirius, and their positions in the sky. NASA (an acronym for “Never A Straight Answer”) has not commented on Hoagland’s speculations. Big surprise! An important aspect of the Orion constellation, astronomically, is that many of the stars in the constellation are further from other stars in the constellation than they are from Earth. In other words, we see only the projection of these stars on what appears to be a flat surface, whereas some of the stars are enormously further away from Earth than others in the same constellation. The notable exception is that the stars of Orion’s “belt” and the Orion Nebula are at roughly the same distance from the Earth, and thus are quite close to each other. This close connection may very well imply a greater degree of importance to these central players in the Orion Constellation than to the rest of the constellation. Nair al Saif (Iota Ori) "bright one of the sword"